Yesterday I posted a couple of pictures of my artwork. In the comments section there, and in a previous post - and mostly in a large number of emails I've received - a number of folks asked about buying some of my turned bowls. Currently, I'm not selling bowls over the internet. This will change eventually, probably after the beginning of the year. This is for a number of reasons: first I've got to set up payment methods, probably a PayPal account. I've had problems with PayPal in the past, and I'm a little wary of that process. However, for most people, PayPal is the most convenient method of payment, but I need to make sure that it works for me. Second, and more importantly, I have to set up a separate catalog page with a way for folks to view each piece in detail. It is extremely important to me that anybody who buys my work has a complete understanding of what they are getting, and that's difficult to do on a computer screen. Buying art, especially woodwork, is a visceral experience, you really need to touch the piece to fully appreciate it - and to decide if it's worth your money. And my bowls are expensive. This is not because I have an over-inflated sense of my craft, but because of the amount of time and effort involved. Each piece can easily cost me well over a hundred man-hours. For example: the raw wood itself has to be harvested, i.e. I have to go into the woods with a chainsaw and ATV. For the heartwood bowls, I can't use just any tree - I need large, older trees that are at least 24 inches in diameter. I'm not big on indiscriminant cutting either, so each tree is carefully selected from areas where the impact on the environment is minimal or from where trees are being cleared already. Not all trees are suitable for the type of work I do. Selection and harvesting is hard work, a three-foot long 18inch in diameter green log can weigh over over a hundred pounds. Because of the area where I'm cutting, each log has to be hoisted up onto the cargo deck of the ATV, strapped down, and brought out through the woods to the truck. Usually this is over pretty rough terrain and through thick Alaskan woods, so I can't use an ATV trailer. This means I can only move two logs at a time on the ATV. Very time consuming. It normally takes two days of backbreaking labor to get enough stock for a month's worth of turning. Once home, each log must be cut into segments, then cut into slabs with the chainsaw. The slabs are then run through a thickness planer to smooth them, then scribed and cut into circular blanks on the bandsaw. Then they are turned on the lathe, this is a lengthy process (but it's also the best part, turning is extremely addictive). Then, depending on the piece, carved or otherwise decorated. 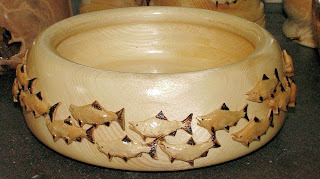 The picture above, which is actually made from Sitka Spruce, not birch, is decorated with carved salmon, a bowl like this can easily require over a hundred and fifty hours to complete. Filigree cut bowls, like this one, can take even longer. So with that said, each of my pieces can go for several hundred dollars, and even at that high of price I'm not making any profit on them. Which is fine, because I'm not doing it for money. Lastly, I'm preparing for a show in December, so I'm building inventory for that and right now, I just can't sell the pieces I have. Come January, I should have a large enough inventory and the other technical problems resolved so that I can begin selling online. Hope that answers your questions. And with that , I'm off into the woods today to retrieve the rest of yesterday's harvest. I'm back from the wilds of SD, and I would like to reserve one of your bowls (once you're ready to sell). I understand and agree with the price - it's art, and you get what you pay for. So make a mental note in your increasingly unreliable brain pan, Warrant. First dibs for the Senior Chief (after family, of course). I'll make sure to set one of the new ones aside for you, Janiece. This new batch of wood should produce some very nice stuff. How was SD? Have fun? Do anything you don't want to talk about in front of the whole internet? Hmmm? I didn't see any major arrests in the SD Trib for this last weekend, so I assume you behaved yourself. I'm soooo disappointed. Oh, and I'm just going to ignore that crack about the unreliable brain pan. I'll have you know that I may no longer be in the combat Warrant mode, but...what? I forgot what I was saying. Never mind. SD was just FABULOUS, thanks very much. I was visiting my best friend from the Nav (who is also retired, an HTC). I go twice a year and we hit the spa, drink Mike's, and eat decent Mexican food. Much giggling and girly time. Since I live in a houseful of men, it's my semi-annual estrogen festival. I'm sure your wife would understand.